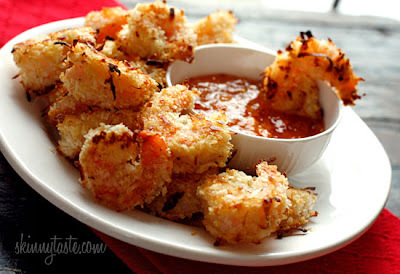 In my quest to see what I can make and freeze I decided to give these coconut shrimp a try. They are from a Weight Watchers blog I read when I was trying to be skinny and I always wanted to try them. I figured if Gorton's could do it, I could too. Turns out I was right this time. And since they are crispy and sweet the boys ate them up. I think Zach might have tried to make me scrape of the breading but he is ridiculous. That is the best part! I made the dipping sauce but really it was not needed. Preheat oven to 425°. Lightly coat a non-stick baking sheet with oil. Lay shrimp on the cookie sheet then spray the top of the shrimp with more cooking spray; bake in the middle rack for about 10 minutes. Turn shrimp over then cook another 6-7* minutes or until cooked though. Remove from oven and serve with dipping sauce. For the sauce, combine all the ingredients and place in a small bowl. *For freezing I stopped after about 4-5 minutes as they get cooked more when re-heated.